The decorative caps are 1/4" deep and have a 1-1/4" diameter. 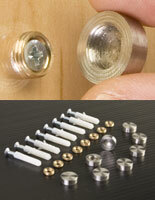 Designed to work with 4mm threaded screws or machined studs. The satin silver finish on the knobs creates interesting looking signs! 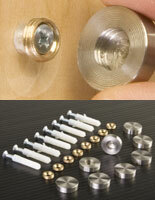 Upgrading an office space can be done instantly with this decorative hardware! 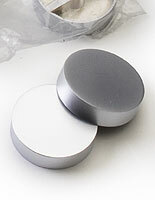 These knobs that are made of satin silver, not pulls, come in a bag of 100 at bulk pricing! It's always good when you think of furniture, to also think about accessories. 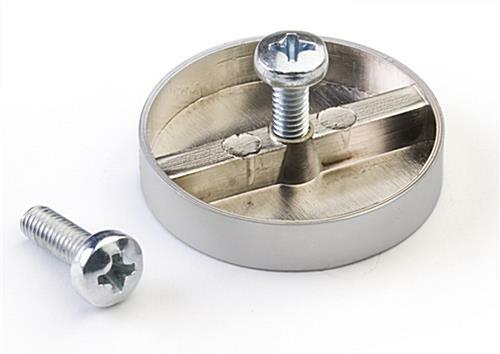 This decorative hardware that is 1-1/4" in diameter x 1/4" covers unsightly screw ends whether you're talking about a podium or a cabinet. 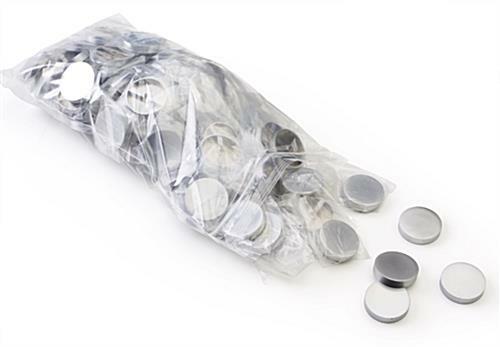 These sophisticated looking screw caps, also known as knobs, to hide things so the display looks finished and professional! Accessories like the one pictured here will last longer if they are not made of plastic, and ours are not! This decorative hardware, like caps is cheap, but it looks expensive! Accessories can be one of those places where you can really make a difference. Want to create 2-sided sandwich signage? 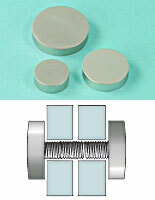 Use these deco knobs just like designers use drawer pulls to update a room or set of offices. Furniture has drawers with pulls, unlike walls that have signs with knobs, like decorative hardware! 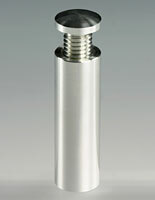 These accessories affix to furniture such as a podium. But mostly they are used as decorative hardware for signage. 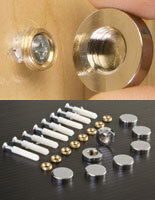 Unlike drawer pulls for a cabinet, these wall fixtures upgrade things quickly! 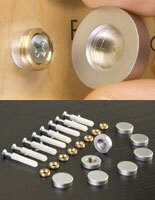 This decorative hardware, called screw cap accessories, can really make a difference visually. The polished silver is attention grabbing! When purchasing a cabinet or piece of furniture, it's a good time to buy decorative hardware, like knobs that are standoffs. There are drawer pulls for furniture that are used to up the style ante in a room, and now these signage fixings can do the same thing!